Find A Tyler Mountain Water Distributor Near You! Excellence in customer service is our goal at Tyler MT. With this objective in mind, we built this website to help direct our customers and potential customers to the local distributor best suited to help you with your water, coffee and filtration needs. As you can see from our service map, there are several different distributors throughout the Mid-Atlantic states. Each of these distributors carry some variety in their product line based on their geographic reach and product availability. We are interested in linking you with the distributor closest to you to facilitate your next order. Home or office, your zip code will help us serve you better and direct you to the site best suited to you. 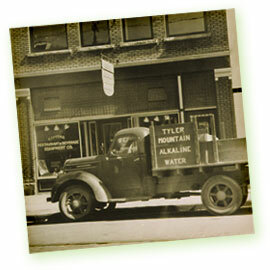 Tyler Mountain Water Company, Inc. has been satisfying the thirst needs of our consumers since the 1930's. Delivering the highest quality bottled water to home and office is the cornerstone that launched our company into a full array of the beverage business that continues today. Our water is a pure, refreshing, and a naturally delicious beverage. You will notice the difference right away when using it in your coffee, tea, juice or any other water based beverage or food. Most importantly it's the natural way to give your body the water it needs everyday. 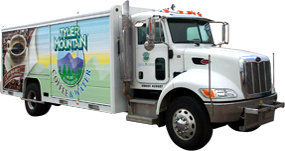 We appreciate the opportunity to serve you and we thank you for thinking of Tyler Mountain Water for your water, coffee and filtration needs. Premium bottled waters and premium servivng systems and accessories. Let us demo a premium coffee system for you, and customize program to meet your needs. Learn more about our free basic water analysis, and offerings for all new customers. It appears we currently do not provide service your area. However, if you Contact Us we would be more then happy to see if we can extend our reach and include your location.